Christmas spirit has come early for today's card. I know we are only in February but last year i failed to make all the cards i needed to so i was left with some very upset family members. This year i promised myself i would atleast do 2-3 per months so i made sure i had enough for all of my friends and family so no one get left out. *First i selected a beautiful pearlescent card and folded it using a scoring board and ensured it had a sharp fold by using a bone fold. *Next i used a circle die to cut out the shape for the window. I overhung the die to get the look i wanted to achieve. *Using the same die along with a bigger circle die, I cut a boarder from mirri card and glued this to the front of the card to make a beautiful boarder. 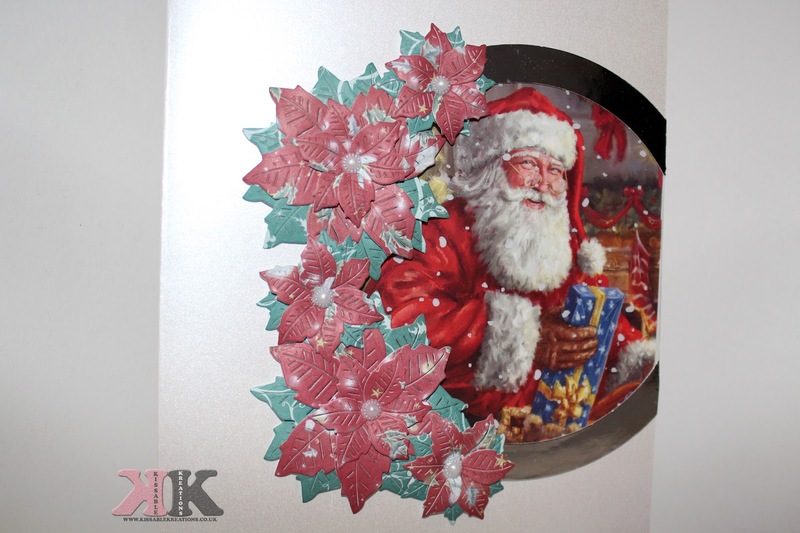 *Using the circle die again i cut out a circle from a snow design acetate and added this to the inside of the card. I then cut off the excess at the side of the card to make it level. *The picture i used of Santa was then glued behind the acetate and cut to size. *Next i made the beautiful poinsettia flowers. I made 2 larger ones and 3 smaller ones. The dies i used were from the Britannia die collection. Is there a certain type of card you would like me to make? Im thinking of starting my Youtube channel so i can show you how i make these cards. Would this be easier then reading? Id also be posting pictures and directions on here for the people who would rather read. you're on it!! i love poinsettia, so festive and christmassy. Really good job with these too, they look great. This card is sooooo pretty and Christmassy. I love the style and colours it's very festive. All your cards are so beautiful. I cannot believe they're homemade!